6 Ws is a new idea I'm trying out, and this is the first one. Inspired by a friend who said that all of us take all these things we know for granted that should be shared. So hopefully at least a few of my friends will do the same thing and share some of the things they know and take for granted. 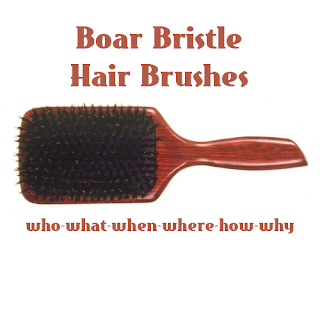 Why boar bristle hair brushes? Yesterday I was washing my hair brushes and trying to figure out how what looked like yarn bits got into it. The answer will probably remain a mystery, but teaching my daughter how to properly clean one, it seemed like a good idea at the time. This will cover why use boar bristle hair brushes, how to clean them, and a bit about the different types. I'm not an expert. It's just my opinion. 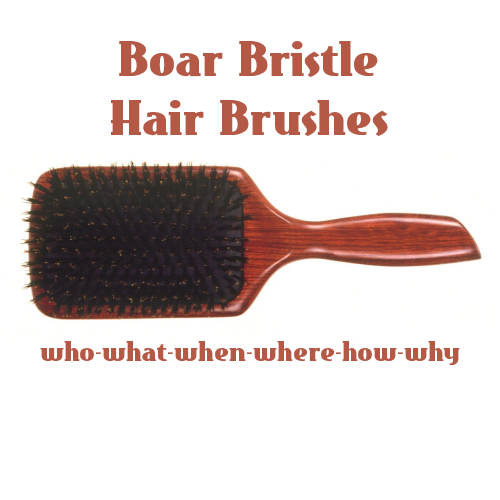 Who should use boar bristle hair brushes? If you have straight or wavy hair, boar bristle hair brushes will probably be excellent for you. Some people recommend them only for short or medium length hair, however, they were frequently used in history by women with very long hair. My own hair is waist length and the only hair tools I use frequently are a wide toothed pick to detangle and boar bristle paddle brush. Basically, it's a brush with bristles made of boar's hair set into a base of some sort. After that, it gets a lot more complicated. Some have cushions which means there is a soft cushion between the bristles and the base of the brush. Others are just bristles set into a brush base. The brushes also come in different lengths and softness. Some are harder than others, and some are very soft. As you use different kinds, you'll find the type that works best for you. The handle/base profile is in part determined by the length of hair you have. For example, the brush above is a large paddle that works well for longer hair. There are some great brushes designed specifically for men's hair which have short bristles and short or no handle at all. Combination brushes will have two or more types of bristles, nylon and boar bristles is a popular combination. Not on wet hair. Ever. If you need to detangle while your hair is wet, use something very smooth with wide set teeth, a lot of people recommend wood or horn combs. I use a plastic hair pick, the same kind my son uses on his very curly hair. If you decide to use plastic, you can sand down molding seam marks by using wet wet/dry sandpaper in a fine size, rinse well and then polish it up with muslin. It seems like a pain, but you only have to do it once for the lifetime of your comb and it will be easier on your hair for taking the time. Other than that, if your hair is dry, brush it once or twice a day. You get what you pay for, there are some decent, inexpensive brushes that come from all over the world. More expensive brushes will last longer and are designed better. English brand Mason Pearson makes wonderful brushes with a rubber pad that helps cut static electricity, but they also cost over 100.00 each. If you have longer hair, you'll want to get the tangles out before brushing. Brushing with a boar bristle brush is less about detangling and more about styling and finishing. You remember when you were a kid and your mom detangled your hair from the bottom up? That's exactly the opposite of how you should brush with a boar bristle brush. You should do long strokes, root to tip. A hard brush can be hard on your scalp, and a soft brush might be too soft. Find the in-between that works best for you. The Mason-Pearson brushes frequently come with a brush cleaner. Most don't and the brush cleaner only works to pull out strands of hair and dust. It doesn't work on the waxy sebum from your scalp which will get on any brush you use. Since bristles are hair, you'll clean it much like hair. Use the back of a comb running it back and forth across the bristles and tapping it bristle side down lightly every so often to shake off the residue. If you have hair (or yarn, seriously, why was there yarn in my hair brush?) in your brush, comb through the brush lightly. Don't force it, you don't want to loosen the bristles. Pull it completely off and clean the comb then repeat until all the stuff caught in the bristles is off. Get the bristles wet in warm water, then use a small amount of shampoo, work it into the bristles, and rinse well. Clarifying shampoos are best, they break up oil and hair product well. Then set the brush down somewhere safe to dry completely before using it again. Do the first method, running the back of the comb across the bristles to shake loose dust daily. Comb out long hair strands weekly, and wash your brush either every 2 weeks or once a month depending on how oily your hair is or how much product you use. What boar bristle brushes do better than any other kind of brush is redistribute the oils from your hair. Those oils are vital for healthy hair, but just at the scalp, it looks awful. When the oils are redistributed down the length of your hair, your hair shines. Not an oily shine, but a healthy shine. The brushes also give a very sleek finish. My daughter likes them because they don't pull her curls the same way other brushes do, and she can get her hair well managed by washing it every other day and using a boar bristle brush between washes. I like them because they do really make my hair very sleek and shiny. The Spornette DeVille brush is very affordable and works well. The Mason Pearson brushes are better quality and more expensive.